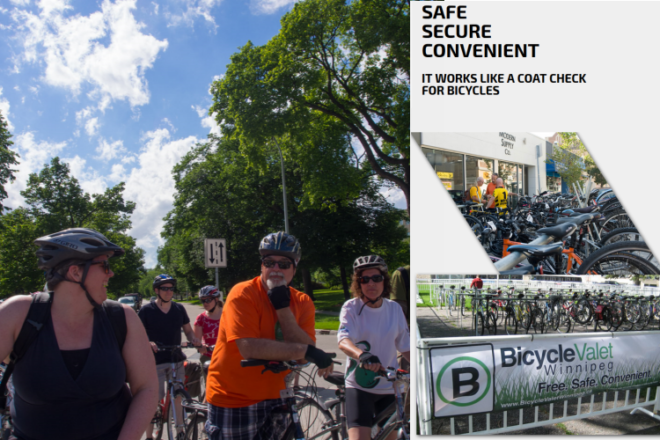 Hop on your bike and explore Winnipeg’s distinct spaces, outstanding architecture and vibrant history with Bike Winnipeg! This casually paced group ride will connect you to a number of free bicycle valet hubs strategically located within a short walk of several featured buildings. Park your bike securely with us as you explore the buildings. Group rides will circulate all day through the Exchange District, Point Douglas, North End and the Downtown (including several “bring your own lock” sites passed on route). Drop off when you reach a desired site, and join back up when you are ready resume your explorations. Guided tours will start at 10:15am, 11:15am, 12:15pm, 2:15pm, 3:15pm and 4:15pm, maximum 60 participants per tour, departing from the Mere Hotel. In regards to the weather forecast: Outdoor events will go on as scheduled if there is light rain. Outdoor events will be cancelled if there are heavy downpours or thunderstorms. Cancellations will NOT be posted.